TELLURIDE, COLORADO — Three decades ago, when Beverly Hills entrepreneur Joe Zoline opened a couple of ski lifts in this steep, isolated valley in southwestern Colorado, he acknowledged that his new venture wasn’t an easy sell. "Telluride is remote and hard to get to," he said in 1973. "It is making it hard to create a successful resort from scratch." He persisted, predicting optimistically that the valley’s scenery and silence would be the secret of its "great and lasting success." Today, it seems that Zoline was onto something: Telluride remains tough to get to, but it boasts a hectic schedule of summer festivals and a busy ski season. Still, how isolated is too isolated? When Telluride’s tiny regional airport recently proposed $50 million in improvements and expansions, it reactivated debate over the valley’s longstanding survival strategy. Some of the possible changes to the airport, say critics, would require intrusive construction projects, lead to increased air traffic and noise pollution, and erode Telluride’s lucrative storybook atmosphere. "The fact that we’re quiet and beautiful is why most of us live here — and why our guests come here," argues Pamela Lifton-Zoline, Joe Zoline’s daughter and a longtime Telluride resident. "We don’t need to get superenthusiastic about the idea that people want to give us all sorts of money to chew up our mesas and make our airport bigger." A matter of economic survival? Perched on the top of a mesa at 9,078 feet above sea level, the Telluride Regional Airport is the nation’s highest commercial airport. Turboprops from four commercial airlines connect Telluride with regional hubs in Denver and Phoenix, and private planes shuttle in the well-heeled. While the accident rate at Telluride hasn’t been out of the ordinary, pilots have to be conservative about weight restrictions because of the thin air and the lack of wiggle room between the runway and the mesa edges. They also have to be wary of the runway, which is about 65 feet higher at the ends than in the middle, forming what’s known around town as the "infamous dip." So three years ago, the Telluride Regional Airport Authority — which oversees the airport and functions as a quasi-governmental organization — approached the Federal Aviation Administration and asked for funding for safety improvements. The FAA said it was willing to provide grant money not only for fixing the runway, but also for expanding safety areas around the runway and building runway extensions — including a 600-foot "displaced threshold" that would allow takeoff of commercial jets, and safer operation of the private jets that already use the airport. Because of the airport’s precarious geography, the safety-area expansion and the runway extensions would require construction of two large retaining walls above the two-lane road into Telluride. The walls would top out at 85 and 130 feet. Almost all the funding for the construction would come from the federal Airport Improvement Program, which is funded by airport user fees and fuel taxes, and often a key source of money for rural airports. 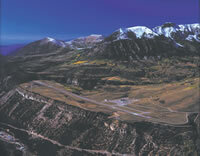 The Telluride airport authority went public with the plan in August 2002, and the San Miguel Planning Commission approved it with some conditions last May. Now the authority must secure the approval of the three-member county commission. Lifton-Zoline and a few other residents, alarmed by the scale of the proposal, have formed a group called Citizens for a Safe, Small, Quiet Telluride Airport. Group members generally support fixing the runway, but oppose the expansion projects. Many would rather see federal and local funds spent on the already jet-accessible airport in Montrose, Colo., about an hour and a half away. Supporters of the full set of projects, including outgoing Telluride mayor and airport board member John Steel, counter that the expansion is important to Telluride’s economic survival: Some airlines have said they plan to phase out turboprops and move to regional jets. Airport manager Richard Nuttall is somewhat more sanguine. "Regional jets may become more prominent, but turboprops aren’t going to go away completely," he says. "There’s always some entrepreneur that’s going to fill the void." Whether the runway extensions would increase the number of flights in and out of Telluride is unclear. Nuttall says consumer demand will be the ultimate decision maker. "The idea that ‘if you build it, they will come’ doesn’t work in this business," he says. But consumer demand may follow close on the heels of an expanded airport, says Ray Rasker of the Bozeman, Mont., office of the Sonoran Institute. Rasker, who has studied growth in many Western resort towns, says improvements in air service often bring in a wave of new people and businesses, especially "footloose entrepreneurs" who want to live in a rural area but need to travel frequently. Though towns with up-to-date airports are thriving economically, they’re no longer the funky, out-of-the-way places they used to be. "The expansion of an airport facilitates the transition into something much more diverse," says Rasker. "Jackson (Wyo.) is not really a resort community any more — it has all sorts of businesses — and Bozeman (Mont.) is a bedroom community for places like Seattle and Salt Lake." So will Telluride take a $50 million step toward becoming what Rasker calls a "micropolitan" area? The San Miguel County commissioners are expected to answer the question in March 2004. The author is a contributing editor to High Country News.